One of our most memorable days at the hospital was Thanksgiving 2011, when we diagnosed and operated on a patient with the first case of tetanus we had seen, a disease that is now almost non-existent in the US because of vaccinations. On Thanksgiving night, Emily and I rode 8 hours in an ambulance, while ventilating by hand this 61-year-old man. Our ambulance became stuck on the muddy, dirt road from our hospital for several hours, blocked by a landslide, and we had to transfer the patient through knee high mud to another ambulance to get us to the city hospital. We were worried that we would run out of oxygen, crucial to keeping our patient alive, but we arrived at the city hospital just in time. After dropping the patient off at 2am, we took the ambulance driver and nurses with us to a super market to eat our Thanksgiving dinner of pizza. The driver and nurses watched us closely as we took our first bites, as they had never seen such a food! The case mix was quite diverse. On a given day, we would care for children with femur fractures from falling out of trees, farm laborers with hand infections that could be deadly without surgical treatment, and teenage bicycle taxi drivers presenting with open tibia fractures after an accident on a mountain road. We also cared for many cancer patients with late presenting sarcomas. 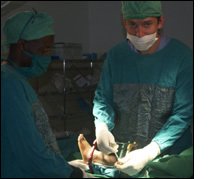 Over the course of the year, I performed >200 orthopaedic surgeries, many of which would not have been performed due to lack of access to surgical care. There is still much medical work to be done, but we are grateful that we were able to spend a year providing and attempting to improve care in Rwanda, and we hope to return for years to come and continue our work.